or this doll quilt, blogged about here. 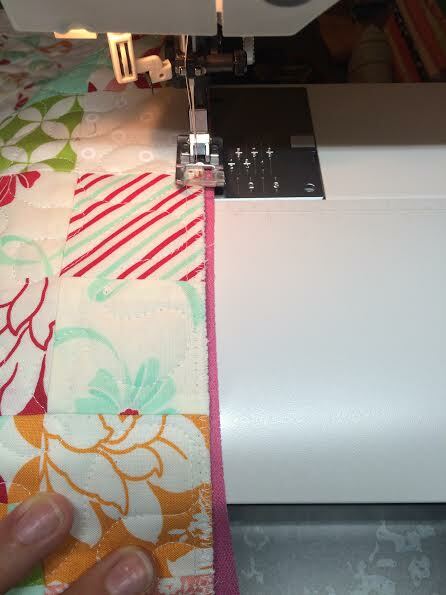 There are 2 sizes available in the quilt stores in a range of colors, I use the larger size, 5/8ths for binding. 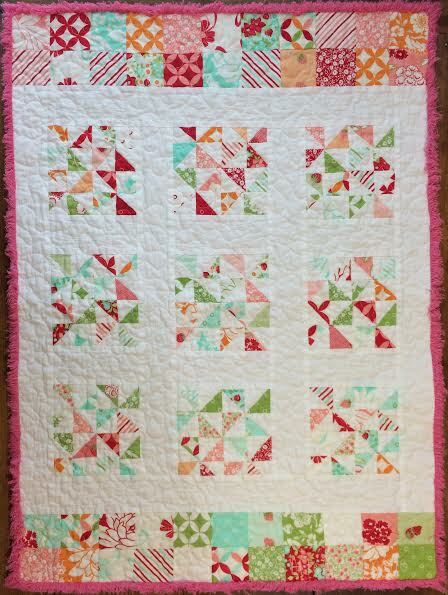 I've seen the smaller size sewn into the pieced side of a quilt to add depth and texture. Don't you hate it when you drop your roll of chenille or binding and it goes rolling across the floor? Problem solved. 1. 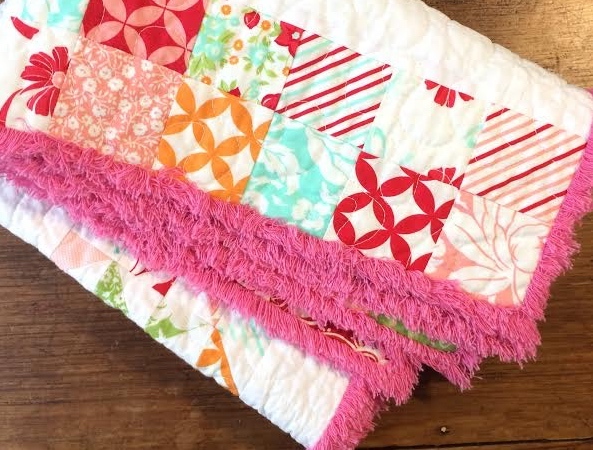 Before sewing the chenille onto the edge of your quilt, you need to trim the edge precisely, and finish it off with a zig zag all the way around. 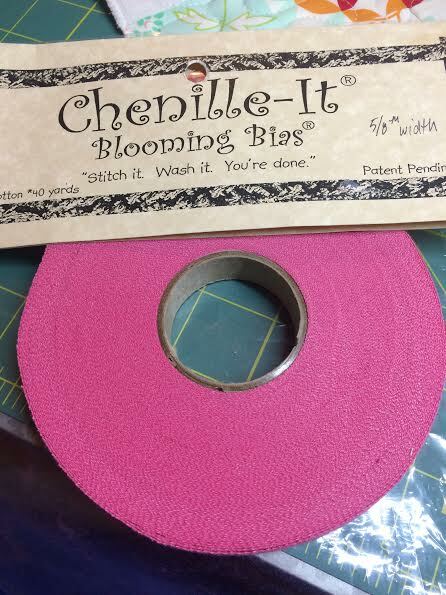 This will help give the chenille something to anchor to. 2. 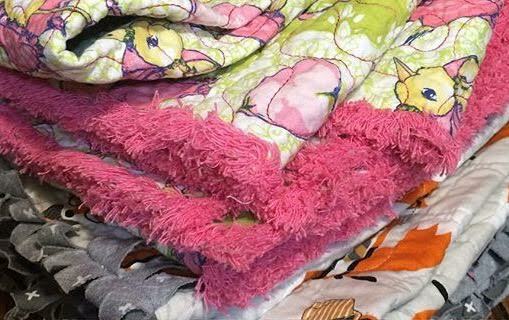 When sewing your chenille onto your quilt, use a small stitch to minimize loss of threads in the washing/drying. 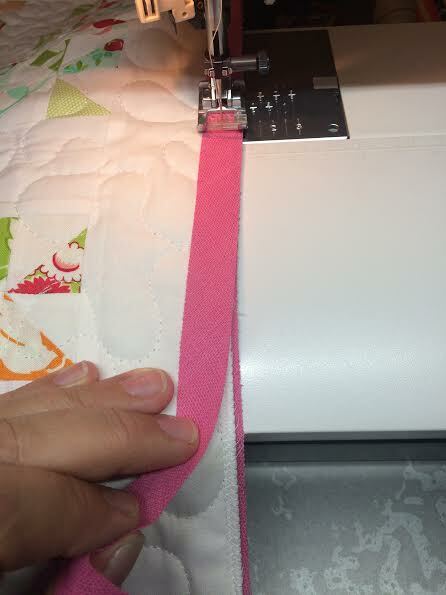 I use a 1.5 stitch size when sewing on chenille. 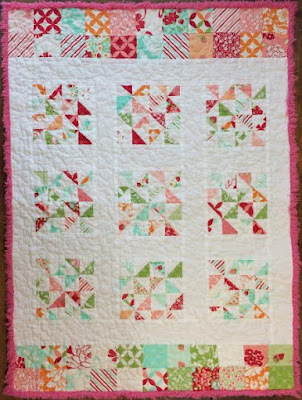 There are 2 strips of chenille sewn all around the way around this quilt. I sew the first one on to the underside, so that I can see where I'm sewing. 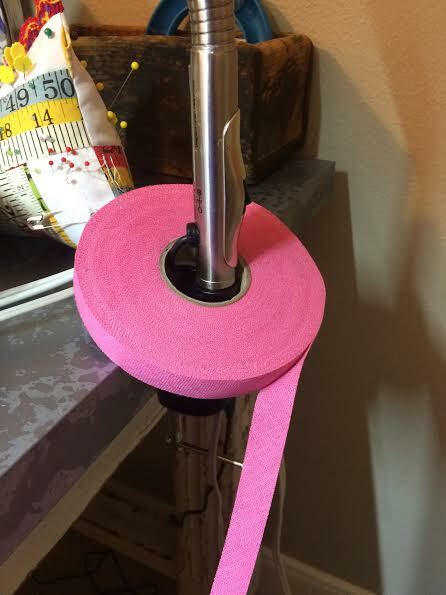 Place the chenille tape so that 2/5th's are showing. You will sew 1/5th inside the edge of your quilt. DON'T FORGET TO SHORTEN YOUR STITCH. 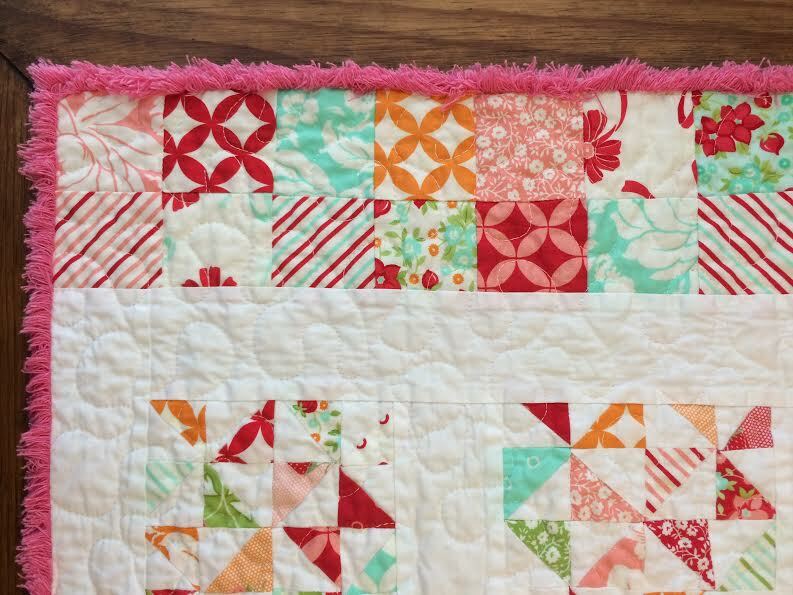 The second strip is sewn directly on top of the first, sandwiching the edge of the quilt, and sewing down the middle of the strip. 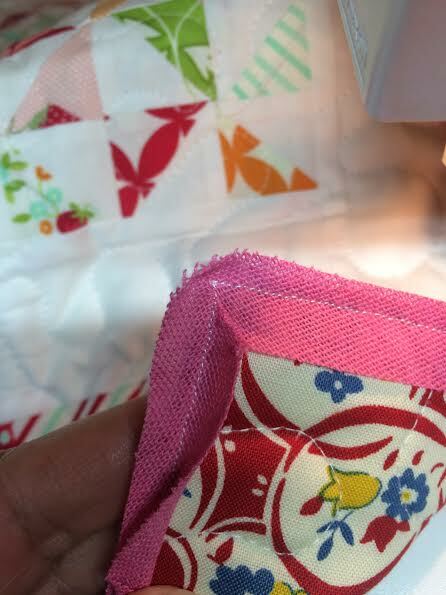 Corners are much like sewing a regular binding on a quilt. Stop just before the end, stop put your needle down and pivot around the corner. Wash and dry. I was surprised that there was not much in the lint catcher. That does look like a really cozy finish for that sweet quilt. Thanks so much for sharing the tutorial! I have just placed a order for chenille. Interesting. So everything is all raw edges? Two layers of chenille with the quilt between them and nothing actually around the quilt edge? really great tutorial - I think I could do it. I had not thought of using chenille in the binding. What a lovely idea. Thank you for your great tips and tutorial.